Adirondack Loveseat Glider Rocker. (c)2009 Chris Baylor licensed to About.com, Inc. 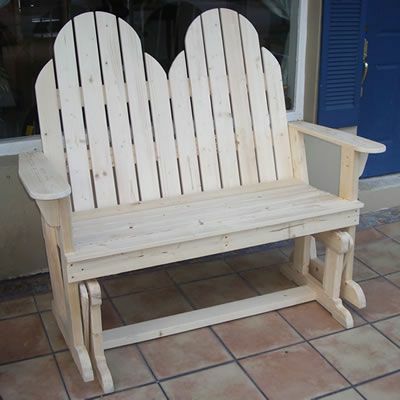 In this set of free woodworking plans, learn how to build a Loveseat Glider Rocker based on a very comfortable Adirondack chair design. This glider rocker is very roomy and comfortable for two people, whether you choose to add cushions or sit on the wood directly. The rocking motion is smooth and the wide arm rests are a great place to set a cool drink while you're relaxing. While this project isn't technically difficult to build, it is time-consuming. Plan on 30-40 hours before you get to the finishing stage, and probably at least 20-30 more for finishing, depending on whether you choose to stain or paint the project. You can build it out of any hardwood or pine. Redwood would be a terrific choice for staining, or poplar if you want to paint the project. No matter how you choose to finish this glider rocker for two, you'll have a piece of patio furniture that your guests will truly admire! 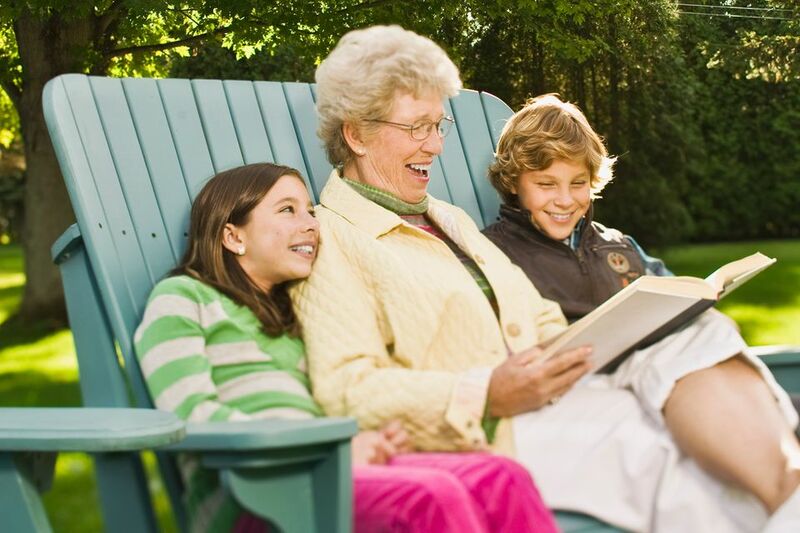 Download the to build this loveseat glider rocker (PDF). Cutting the Base for the Glider Rocker. (c)2009 Chris Baylor licensed to About.com, Inc.
To begin building the Adirondack chair-style Loveseat Glider Rocker, we'll start by cutting the feet for the base of the glider rocker out of 2x4 on the band saw. You can cut these feet in any shape that you like as long as it is something similar to the shape on page 3 of the Free Plans you downloaded in step 1. Next, using your circular saw or compound miter saw, cut two 2x4 sections at 16" and round over the four corners with a 1" radius on your band saw. These two pieces will form the tops of the base sides (as shown on Page 3 of the plans). Then, cut four 2x4 pieces at 15-1/2" to serve as the vertical pieces on each end of the base. While you're cutting, cut two pieces of 2x4 at 42" in length for the top and bottom spreaders. With each of these ten pieces cut, set up your table saw with a stacked dado blade set to cut half-lap joints in the foot, top and two vertical pieces of each side of the base, as shown on page 3 of the free plans. With the half-lap joints cut in all four pieces of each side of the base, dry fit the four boards together to check the fit. If it looks good, assemble using some woodworking glue and 1-1/4" deck screws in pre-drilled, countersunk holes. Repeat with the opposite end of the base. Now would be a good time to sand each of the two base side assemblies. Pay special attention to the curved cuts from the band saw. After both base sides are completed, install the two spreaders between the two bases, as shown on page 2 of the free plans. These two spreaders should be centered on the top and bottom of the base sides, as shown. Attach using 2-1/2" deck screws. Assembling the Chair Sides. (c)2009 Chris Baylor licensed to About.com, Inc.
With the base completed, we'll turn our attention to the Adirondack chair structure of the loveseat glider rocker. Using your circular saw or compound miter saw, cut two 2x4 boards at 22-1/8" (for the bottom pieces), three at 20" (for the seat supports) and another two at 28" (for the front). Then, cut two pieces at 29" in length (from long point to short point) at a 15-degree angle miter on each end (as shown on Page 4 of the Free Plans you downloaded in step 1). Next, switch to your band saw, and make a 3-1/2" radius cut on each end of the two boards for the bottom pieces (as shown on page 4). Then, lay out and cut the angles on the three seat supports as shown on the diagram on Page 5 of the plans. Note: Be sure to cut these three as accurately as possible, as all three will work together to hold the seat slats at the proper positions for comfortable sitting. Now, return to your table saw with a stacked dado blade set to cut half-lap joints in the two bottom pieces, and the bottoms of the front and back pieces. Notice that the half-lap for the back pieces will be cut at a matching 15-degree angle. To assemble each side section of the chair, connect the pieces at their respective half-lap joints using woodworking glue and some 1-1/4" deck screws. Then, using some 2-1/2" deck screws, attach one of the seat slat support pieces at the appropriate height on the inside of each end as shown on page 4 of the plans. Note: Keep in mind that on the right side of the chair, this support will be on the left side (or inside) and on the left side of the chair, the support will be on the right side (again, on the inside as the two ends face each other). Adding Spreaders to the Glider Rocker. (c)2009 Chris Baylor licensed to About.com, Inc.
With the two structural chair ends of the loveseat glider rocker completed, the next step is to connect these two ends with the spreaders. Using your circular saw or compound miter saw, square cut two 1x4 pieces at 51" in length. Using 2-1/2" deck screws in pre-drilled, countersunk holes, attach one of these to the fronts of the two ends flush with the top of the two seat slat supports, and the other to the backs of the two ends, again flush with the tops of the seat slat supports. Be very cautious in making sure that the boards are attached square to the sides. See the image above for correct placement. To complete this step, mark a center point on the two spreaders, and attach the middle seat slat support so that it is perfectly centered between the two ends, with the top of the support flush with the two spreaders. Attaching the Back Spreader. (c)2009 Chris Baylor licensed to About.com, Inc.
Now that the two seat spreaders and all of the seat slat supports have been added to the assembly, the next step is to add the back support that will help hold the Adirondack chair back slats. Using your circular saw or compound miter saw, cut a section of 1x4 to 55" in length. Then, with your band saw, cut a 2" radius on one of the corners on one end of the board. Follow up by cutting the same corner on the opposite end of the board. After cutting curves and sanding the board completely using your random orbital sander, make a pencil mark perpendicular to the long axis of the board two inches in from each end of the board. Then, attach this board to the angled back boards of the two chair side assemblies. This back spreader should be flush with the top of the angled back boards, and the 2" mark should match up with the outside edges of the angled back boards of the two chair side assemblies. Pre-drill, countersink and attach with 2-1/2" deck screws. See the image above for clarification. Attach the Back Slats. (c)2009 Chris Baylor licensed to About.com, Inc.
Time to work on the curved back slats. These slats will be installed, then the curves will be marked so they will have the proper continuity. After marking the curves, each board will be removed, the curve cut on the band saw, then returned and permanently installed. To begin, use your circular saw or compound miter saw to cut eight 1x4 boards at 38" in length, and another eight at 32" long. Also, cut a couple of pieces of 1x4 at 1/2" in width for spacers. To install the back boards, we'll start in the middle and work outwards to ensure that the boards will be evenly spaced. Find the center point on the back spreader and make a pencil mark on the inside face (the face onto which the back boards will attach. Then, make another mark 1/4" on each side of this center mark. Do the same on the lower spreader. Next, take two of the 32" back boards and, with the band saw, cut a notch 1/2" wide by 3-1/2" long. These notches are to go around the center spreader. Attach these two boards with countersunk 1-1/4" screws from the back side (through the spreader), aligning the notched side of each on the appropriate pencil marks you made earlier in this step. Check to make sure that the boards are square to the spreaders. The bottom of the boards should be flush with the bottom of the lower spreader. Then, attach four 38" boards to each side of the first two, flush with the bottom spreader and using the spacers to ensure proper separation. Finally, attach the last two 32" boards to the back, notching around the two seat supports. Next, use a scrap of stock or a length of string along with your pencil to mark the semi-circular arcs for the curved backs as shown on page 7 of the plans. Remove each board, cut the arcs on the band saw, and re-install. TIP: Use the arc you cut on the first long board in the series to trace the arcs to the short boards. Attach the Seat Slats. (c)2009 Chris Baylor licensed to About.com, Inc.
After the back slats have been cut and attached, be sure to give them a good sanding using your random orbital sander. Then, we'll turn our attention to the seat slats. Using your circular saw or compound miter saw, cut four sections of 1x4 to 48" in length, and another at 51" long. Then, using your band saw, cut a notch in the same side of each end of the long board 1-1/2" in from each end, and 1-3/4" in from the same long edge of the board. These notches will allow the front board to be installed around the two vertical posts of the sides of the seat. Position this notched board on the seat supports so that the notches are flush with the vertical posts, and attach using 1-1/4" deck screws (be certain to countersink and pre-drill before attaching). Then, using your 1/2" spreaders from the previous step, position one of the 48" seat slats directly behind the first slat. Align the edges of the board with the outer edges of the seat supports and attach with deck screws. Continue with the other three seat slats. Attaching the Rocker Arms. (c)2009 Chris Baylor licensed to About.com, Inc. The next step of these free plans is to cut and install the rocker arms and bearings. No matter what type of stock you used for the base and the chair, the rocker arms should be cut from hardwood, since the entire weight of the chair and the occupants will be on these four pieces of stock. With your circular saw or compound miter saw, cut four 1x4 sections of hardwood to 14" in length. Round over the corners with a 1" radius using the band saw. Then, make a pencil mark 1-1/2" in from each end on center (1-3/4" from the edge) of each board. These marks will be the locations for the bearings and bolts. On the outside edges of the chair base, make four pencil marks for bearings as well. Each mark should be 1-3/4" in from the ends of the rounded top board on each end of the base, and 1-3/4" down from the top. Finally, on the insides of the curved base boards on the bottom of the chair assembly, we'll need four marks for the bearings as well. These should be 1-1/2" up from the bottom. Measure 8-1/2" back from the front end of the curved chair base board, and 6" forward from the back end of the chair base for the marks. Now, depending on the bearing assemblies that you chose for the glider rocker (that should include eight bearings, the bolts, washers and nuts, plus some 1/2" pan head screws to hold the bearings in place), drill the appropriate diameter holes for the bearings at the marked locations. The holes in the chair and the base should also have a countersink to accommodate the bolt head, whereas the rocker arms should have through holes, with countersinks the width of the washers on the opposite sides of the board deep enough to accommodate the nuts. Sand the rocker arms and assemble the base, rocker arms and chair using a socket set to tighten the nuts as shown in the image above. PLEASE NOTE: Although the placement of the bearings worked well when the prototype was built, a number of users have written and said that the chair tended to tip over backwards when the rear bearings are placed at 1-1/2" in from the rear. Moving the bearing in to 2-1/4" solved the problem for them. Attaching the Additional Back Support. (c)2009 Chris Baylor licensed to About.com, Inc.
With your circular saw or compound miter saw, cut one length of 1x4 to 44" in length. Sand it completely using your random orbital sander before installing. To install, measure 13" down the back side of the tallest back slats and make a mark. Then, position this support board so that the top edge of the board is on these marks, and so that it is equally centered side to side (approximately 1-3/4" in from the outer edges of the outermost back slats). Attach with two pre-drilled, countersunk 1-1/4" deck screws to each back slat. Cutting the Arm Rest Support. (c)2009 Chris Baylor licensed to About.com, Inc. The last step to these free plans for an Adirondack Loveseat Glider rocker is to cut and attach the arm rests and supports. Cut two sections of 1x6 to 26" in length. Then, layout the arm rests according to the diagram on page 6 of the Free Plans you downloaded in step 1. Cut the curved sections on the band saw. You may wish to cut the angled section on the band saw, or with your circular saw. Sand the arm rests completely using your random orbital sander before installing them onto the tops of the chair side posts. The flat edge of the arm rest faces the seating section of the chair, and the back edge is flush with the top of the curved back support rail. Attach with pre-drilled, countersunk 2-1/2" deck screws. Next, using your band saw, cut a pair of supports for the front portion of the arm rest. These supports can be of any shape you deem appropriate, so use your creativity as you desire. I chose to make mine 3" wide by 5-1/2" tall, with a similar angle from the bottom toward the top as the angle on the arm rests. Center the supports perpendicular to the front posts and the long axis of the arm rest on the outside of each front post, and attach using pre-drilled, countersunk 2-1/2" deck screws from the top (through the arm rest) and inside of the chair (through the front post). Except for the finish, your Adirondack Loveseat Glider Rocker is now complete. The choice of finish is completely up to you. Although it isn't shown in the images here, I chose to paint my glider rocker. This entailed filling all screw holes with wood putty, disassembling the rocker arm assemblies, sanding every surface, giving each and every exposed joint a good caulking, followed by primer and top coats of paint. Should you choose a stained finish, be sure to give it plenty of protective top coating (such as polyurethane for protection).